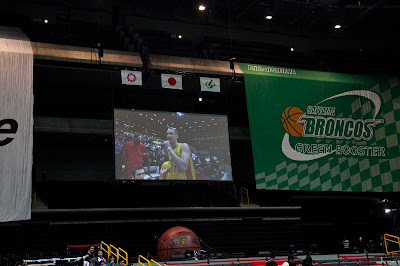 I just had my first all star experience this past weekend in Saitama, Japan for the BJ League. I also got to participate in the 3 point contest which was a lot of fun. 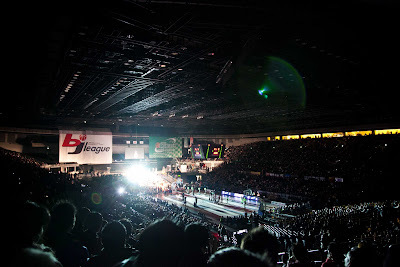 Saitama Super Arena was packed with 14,000 people to watch the best players in the league perform. Saitama is just outside of Tokyo, which made it a perfect host to the festivities. Some of the notable American players people in the U.S. may recognize are: Lynn Washington and Jeff Newton(Indiana alumni), John "Helicopter"Humphrey (AND1), Lance Allred (Weber St./Cleveland Cavs), Justin Burrell (St. John's), Ray Nixon (Wisconsin), and Kevin Palmer (Texas A&M). 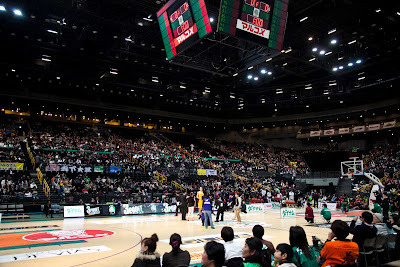 They also included several of the league's Japanese stars, which makes for a fun atmosphere for the fans. Surprisingly, this was my first ever official 3 point contest since high school. 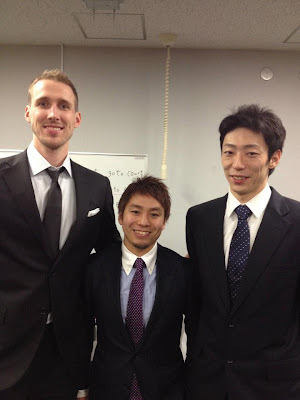 They only invited two americans to participate, all the rest being japanese who are known for their spot shooting. I won the first round, and went head to head in the final against the only 6-time all-star in the leagues history in 5'4" Japanese phenom, Cohey Aoki. It came down to my last money ball that rimmed in and out, and I lost by one! It made for an exciting start to the weekend's events, and I definitely want to come back next year to avenge the loss. John "Helicopter" Humphrey won the dunk contest, adding another title to what I'm sure is a long list of dunk titles. The game was an offensive affair, just like an NBA all-star game, the West outscoring the East as both teams scored in triple digits. The entire weekend was a lot of fun to get to know guys from other teams and represent our respective clubs. It's amazing to me how big the game of basketball is growing in the world today. I never would have thought the game was this big in Asia, but it is certainly one of the biggest rising sports all around the world. The event had a big-time atmosphere and I felt like I was back in the Bradley Center! This game has taken me to so many places around the world, and this weekend's all-star events in Japan will be a memory I will never forget!